Greetings and Solutions! Good Morning! Howdy! In case I missed anyone, Hi, there!! Glad you could join me on this most auspicious occasion. So, what's the occasion? It's the best day of your life. See, yesterday's gone, and tomorrow isn't here yet. That means you've only got today. And God doesn't make rotten days! I could take this to extremes, but you get the picture. Hehehehehe ¦..
Where's my coffee? Must of left it in the kitchen. Gotta get it, and then we can start. There! That was one good swig. Dad used to say, "The first sip tastes just like the last one," as his reason for not having too much. (He was also famous for saying "The first bite tastes just like the last" when it came time to have a bowl of ice cream.) My answer to him was, "Yeah, but I like all those sips in between, too!" Sooo .... got your cup poured, yet? Gotta share a miracle of healing with you before we get started. Last Sunday, Michael and Melissa's daughter, Amber, brought her son, Tristan, for prayer. He was running a fever, a temperature of around 106, and the skin was peeling off his hands and feet. No one had any idea what the problem was. Amber (and her husband, Dan) had taken Tristan to local doctors who had simply brushed it off as "the flu" or some kind of virus that would subside quickly. The situation had been worsening and Tristan was pretty listless when Amber brought him in for prayer. We anointed Tristan with oil and prayed over him, declaring the Word of God as the basis for his healing and complete restoration. Although he seemed to brighten up at the time, through Monday and Tuesday, there was little real improvement. 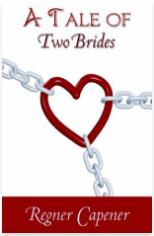 By Wednesday, Amber had been able to get Tristan into another doctor who decided that Tristan either had Scarlet Fever or a dreaded disease known as "Kawasaki Disease," which is a virus-driven affliction that literally eats the body from the inside out, destroying cells, tissue, blood vessels and organs systematically and progressively. Amber and Dan decided to get Tristan over to the Children's Hospital in Seattle. By Wednesday night Tristan was pretty much out of it. A team of doctors ran a series of tests on him yesterday morning, and by 11:00 AM had concluded that he indeed had the dreaded "Kawasaki Disease." They were frustrated because -- as they described the situation to Amber and Dan -- had Tristan been diagnosed properly from the start, he could have been immediately treated with an antibiotic which stops the spread of the virus. By this time, however, his condition had reached a critical stage with the blood vessels being now so thin the doctors feared an aneurism or a heart attack. They expressed concern over the ability to effectively treat Tristan before it was too late. Amber called her folks, and Michael immediately shared with Della and me. We joined in agreement, declaring war on this virus and commanding the Spirit of Infirmity to loose Tristan. Again, we commanded the authority of God's Word over him, declaring from I Peter 2:24, "Who his own self bare our sins in his own body on the tree, that we, being dead to sins, should live unto righteousness: by whose stripes ye were healed." Michael and I both became really angry as we were declaring the Word -- angry at Satan and his effort to steal, to kill and destroy these children. (We have another similar situation pending with the 2-1/2 or 3-year-old grandson of Nora Whitaker -- another sister in the Lord here at River Worship Center. We'll tell you about his healing next week.) Michael and I both said -- almost at the same time -- "This will not stand! We will not allow this attack to continue." We all had peace in our spirits that indeed the Word had gone forth just as the Scripture declares in Psalm 107:20, "He sent His word, and healed them, and delivered them from their destructions." By 4:00 PM yesterday afternoon, the head physician presiding over the team of doctors in Tristan's case had run another series of tests and declared Tristan to have been so recovered that he could be released from the hospital. The other doctors in the team argued against it because of the earlier morning test results, and the head physician gave them freedom to check the new test results to their own satisfaction. By 6:00 PM last night, everyone was in agreement. Tristan had totally recovered. If I say that they were astonished at what happened, it would be a masterpiece of understatement. One of the doctors said to Amber and Dan, "Tristan's recovery is perhaps 1 out of 2 Million cases of this disease. People simply do not recover when they are this far advanced." It was nothing less than miraculous, and Tristan's case will go down in the record books. Today, Tristan and his parents are back home here in the Valley. See? "He sent His word, and healed Tristan, and delivered him from their (the Kawasaki virus') destructions!" I have just one thing to say about this: HALLELUJAH! Don't you just love it when the Lord does things like this? Well, let's see if we can wrap up this picture of "I shall dwell in the House of the Lord forever." Referring to the "House" of the Lord, the Hebrew text uses the word, - bayith. This word describes "family retainings," and incorporates both the concept of palace and temple in the sense of "a royal house." Since the picture of a palace or "royal house" conveys the place or residency of final power and authority -- dominion, if you will, David clearly knows the object and purpose of the paths of righteousness. The paths of righteousness, in which we have been being led, lead us to the goal and objective Jesus Christ established before those first words of Creation, "Light be," were uttered. It was that place of dominion where Adam and Eve resided. The Garden of Eden was nothing more than a copy of a portion of Heaven. The Garden was intended to become an extension of Heaven itself, with Adam and Eve exercising dominion over all the earth and growing the Garden to the place where it encompassed the entire globe. Here's an interesting tidbit for you. Our oldest son, Chris (Christian), has for several years worked for an oil services firm under contract to ARCO and BP on the Arctic Slope of Alaska. Several years ago, he was hired to participate in the building of an island in the Arctic Ocean north of Prudhoe Bay. Once completed, a number of oil rigs were put up on the island, and they began to extract a prodigious amount of oil from beneath the Arctic Ocean. That island is still being constructed (this is not an oil platform like you see in the Gulf of Mexico or in the North Sea off the coasts of England, but an actual island constructed from the ocean floor up) but they've made sufficient progress to have done a test well from that island. Chris was telling me that just a couple weeks ago, they pulled up the drill bit after having gone down some 26,000 feet. On that drill bit they found whole palm leaves and live bacteria that predate Noah's flood. When Chris told me about it, my natural reaction was, "PALM LEAVES????!!!!! Beneath the Arctic Ocean? Five miles deep?" Tests are currently being conducted in some laboratories in Denver on the bacteria, but what seems clear from the discovery is that Alaska and the Arctic were once very tropical prior to Noah's Flood. We know there are petrified forests near the coastline in northeastern Alaska near the Canadian border. What it all suggests to me is that Adam and Eve had extended the Garden of Eden much farther than current thinking allows. Even allowing for the fact that the entire earth was covered with water for several months, and sea-going currents could have moved vegetation and debris considerable distances during those months, it does not account for a find like this. Most of us tend to think of the Garden of Eden has having been restricted to the Middle East, encompassing the land or territories we now know as Iran, Iraq, Turkey, Saudi Arabia, Jordan, Israel and the Sinai -- and some folks think it was even smaller than that. Yet when you consider Adam and Eve's lifespan being measured in millennia instead of hundreds of years (By my estimates, Adam was 2,930 years old -- or thereabouts -- when he died, since time was not measured as we calculate it until they were evicted from the Garden. [See II Peter 3:8 for example]), it takes no great imagination to see the Garden flourishing until it covered a huge region of the earth. Anyway, enough of my kibitzing and speculation. The point here is that Adam and Eve really DID grow the Garden as they were commanded. They were exercising the dominion over the earth that God had given. Every living creature was subject to them. They exercised the same kind of dominion on earth that God exercised in Heaven. There was a continual flow of communion between God and man. The "House of the Lord" had a corridor (Think that was a "wormhole" like the one in Stargate? I doubt it.) that passed between Earth and Heaven essentially extending the "House of the Lord" to incorporate all that Adam and Eve ruled. So why are we having this discussion, anyway? When John was given the Revelation, one of the things he heard in Heaven was, "Thou art worthy, O Lord, to receive glory and honor and power: for thou hast created all things, and for they pleasure they are and were created." We were originally created for His Will, His Desire, His Pleasure, His Choice, His Purpose and His Decree. (All of this is wrapped up in the Greek word, -- thelema: translated "pleasure.") Now do you understand the phrase where David writes, "He leadeth me in the paths of righteousness for His name's sake"? Everything that Jesus was and is and ever shall be is at stake in His leading us in those paths of righteousness. His name is at stake in us. We were created for Him. We were created to be just like Him. We were created to function just like He does. We were created to operate in power and authority just like He does. In short, we were created to be His brothers and sisters -- His family -- so that He could enjoy our fellowship. There's a word for you: fellowship! It comes from the Greek, -- koinonia. This is one of those multi-faceted words in Greek that draws a very large picture, but the simplest way of illustrating is to describe it as: having all things common. The Greek, koinonia, comes from its counterpart, koinonos: an associate, a sharer, a partner. The bigger picture of koinonia is that of: partnership, companionship, co-benefaction. It is a picture of equals functioning together, living together, companioning together in love and friendship so that each party is mutually benefited by the relationship. Understanding this concept is key to understanding the purpose of our existence and the reasoning behind the agreed-upon communion in Heaven that resulted in "Let us make man in our image, after our likeness: and let them have dominion..."
If God had intended for man to be an inferior species -- a sub-species, if you will -- He would never have set about to mold, create, form and speak into existence a being who was just like Him, who looked like Him, who thought like Him and who spoke like Him. The loss of that status that came when Adam and Eve ate of the Tree of the Knowledge of Good and Evil meant that for God to have His purposes fulfilled and accomplished, a means would have to be in place to rectify Adam's screw-up. He WAS, after all, going to get for Himself exactly what He had purposed from the beginning! The rectifying of Adam's giving away of that place of dominion -- and with it the cutting off of the fellowship, the harmony, the companioning together between God and man, then, must -- of necessity -- begin with the restoring of Jesus Christ as Lord and Shepherd. 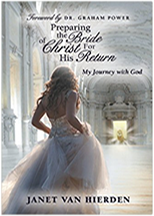 Restoring the Lordship of Jesus Christ then meant the return of the Garden of Eden with "I shall not want." We've already noted that Eden literally translates to "voluptuous living." Voluptuous living translates to the absolute epitome of abundance in every area: hence, "I shall not want." Because communion with God was cut off, His Word was necessarily cut off. That meant the necessity of bringing us back to His Word. Hence, "He maketh me to lie down in green pastures." Since we are first and foremost spirit beings, created like God who is a Spirit, it follows that we must be able to function with the Lord in the realm of the Spirit. Because His Word operates with spiritual power and authority, we must -- of necessity -- likewise learn the operation of the Word through the Spirit. That means we must be filled with the Spirit, and that is a daily process. The Lord, therefore, leads us beside the still waters so we can drink, and drink, and drink, and drink, and drink as often as necessary. But all of this only opens up areas of our lives -- maybe a very large part! -- that is in need of being restored to His image and likeness. Thus, restoration begins: restoration of our thinking, restoration of our speaking, restoration of our doing. And all of that sets the stage for -- and this is only the very beginning: kindergarten, if you will -- our walk in the paths of righteousness as the Lord Jesus Christ, by and through His Spirit, rebuilds His character and likeness in us. As already noted, His name, His character, His reputation, the very essence of all that He is, is at stake in this rebuild of our character and makeup. Along the way, we come to realize that -- despite all outward signs to the contrary -- He never leaves us nor forsakes us. Life is going to take us into the Valley of the Shadow of Death where every effort of the Enemy to rule our lives in fear and torment -- the way he used to do before we began our walk in and under the direction of His Lordship and Shepherding -- will come at us again to steal all that Jesus Christ has done in us, and is doing. Despite Satan's best efforts, the rod of authority of the Lord Jesus Christ, and the staff of His guidance will continually be there to steer us as we respond. The longer we walk in these paths of righteousness, the more the Valley of the Shadow of Death will become just that: a shadow, an apparition: not the reality. And while our enemies are yet around us, the Lord will bring out His blessings and His abundance to set before us so that our enemies realize that God is our source, our provision, our protection; and they'll not be able to touch us. Now comes the moment of our anointing as we are prepared to go forth empowered by the Spirit of God. Now comes that instant in time when the Lord says to us and of us in the sight of others, "This is my beloved in whom I am well pleased." You simply cannot have that experience of knowing the anointing and seeing it operational in your life without the accompanying "cup running over." Everywhere you go, from this moment forward, the Blessing of the Lord will manifest in your life. Everything you put your hand to will prosper.Â You'll begin to see results -- permanent results -- from the operation of the Word and the Spirit in and through you. By now the character of the Lord, His Love, His Grace, His Power, His Authority -- all that He is -- will become a covenant manifestation in your life. The goodness of the Lord and His sure mercies will follow you everywhere. They will be the natural byproduct of your life. And all that brings you to the House of the Lord -- FOREVER! This was the objective from the beginning. Now the objective has been achieved. What's so spectacular about having reached this place is that now things can REALLY get under way. That partnering, that companionship, that fellowship with God that we were created for in the first place can really kick in. This is where we're headed folks! We have an entire world scrambling for what it knows not; and this -- the manifestation of fully mature, fully grown, fully operational sons and daughters of God -- is what the world cries out for in pain and travail. Come on, folks! My brothers, my sisters, Grow up! Let the Lord accomplish His will, His purpose, His heart's desire in you so that you become that friend, that companion, that partner the Lord has been seeking all this time. The world waits to see what God has accomplished! The Bible is neither a collection of laws and commandments nor a book of rules. It contains 66 bags of seed that we can plant in our lives. As long as we actually plant that seed, and then water it appropriately with our daily confession of faith, we will receive the expected and very tangible harvest. All Coffee Break articles are copyright by Regner A. Capener, but authorization for reprinting, reposting, copying or re-use, in whole or in part, is granted –provided proper attribution and this notice are included intact. 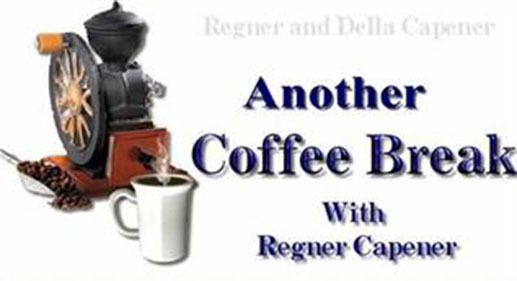 Older Coffee Break archives are available at http://www.RegnersMorningCoffee.com. Coffee Break articles are normally published weekly. If you would like to have these articles arrive each morning in your email, please send a blank email to: Subscribe@AnotherCoffeeBreak.com.To remove yourself from the mailing list, please send a blank email to Unsubscribe@AnotherCoffeeBreak.com.